"He doesn't have any drop off!" Truer words were never spoken from fellow line mate, Eric Fehr, when asked by the Tribune Review about Matt Cullen playing at the age of 40. 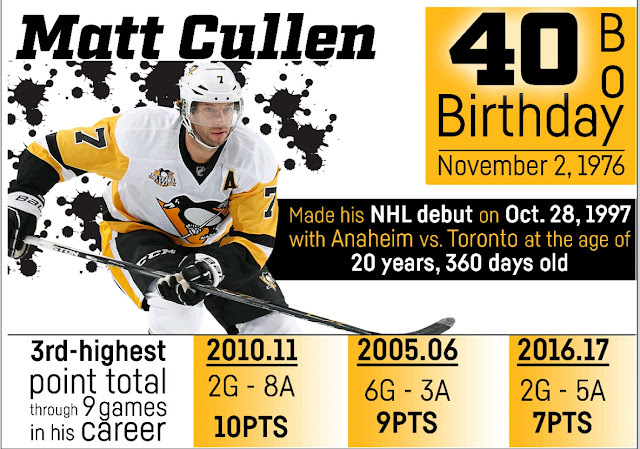 Yes, as of Nov. 2nd, Matt Cullen is 40 years old. This makes him one of only three active 40 or over NHL players (Jaromir Jagr, 45 and Shane Doan, 40). Going into the game Wednesday night and playing in his twentieth season in the NHL, Cullen lead the Penguins in points per 60 minutes of play when at even strength (3.58). That stat was impressive enough when compared to his own team mates. It became even more so when taking into account that teenage phenoms Auston Matthews and Connor McDavid, both 19, had 3.01 and 2.92 points per 60 minutes, respectively, at the time. Those stats have since changed however and you can Google the updated statistics on your own. Cullen played up and down the line up for much of last season and into the start of this one due to the absence of injured players such as Captain Sidney Crosby. His versatility and ability to adapt to situations is paying dividends. Cullen is carrying his third-highest point total through ten games played since the 2000-01 season (eight points, three goals/ five assists). A few other stats worth noting are that he stands fourth on the team in overall points (behind Evgeni Malkin, Patric Hornqvist, and Phil Kessel), and is leading the team in plus/minus rating (+4). Not to mention that he is also the Penguins best faceoff man (eighth in the league overall) with a very impressive 60.0% face off win percentage. To put that into perspective, the Penguin's second best faceoff man, Nick Bonino, is ranked 59th overall with a 49.5%, through the same amount of games. "I think it's extremely impressive," said fellow veteran and alternate captain, Chris Kunitz. "It's extremely important that he shows the young guys what it means to be a professional and what it takes to prepare and work at it if you want to play half as long as he has." Cullen was drafted by the Mighty Ducks of Anaheim (now called the Anaheim Ducks) in 1996. He made his NHL debut Oct. 28, 1997. 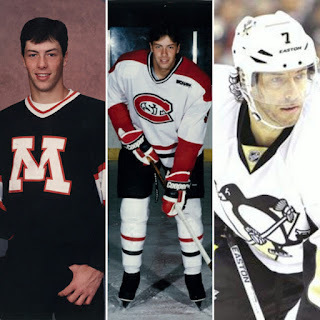 Twenty years and five days later, having hoisted two Stanley Cups in that timespan, he faced his first team (out of the eight that he has played for) on a milestone birthday. It was questioned whether or not Cullen would return to Pittsburgh after last season. The "ageless wonder," as he has become known as, played in all 115 games and shows no signs of slowing down. Cullen was one of only five other players aged 36 and over to tally 15 or more goals during the 2015-16 season. The others include notable names Jerome Iginla, Pavel Datsyuk, Shane Doan and Jaromir Jagr. After much debate, along with rumors that he was thinking of returning to the Minnesota Wild (he is from that state after all), the organization came to terms with the journeyman on a contract for one year, worth $1 million dollars, this past August. His return to the Penguins delighted his team mates as well as fans. Not many players can say that they continued playing into their forties. Not just play, but thrive and stay competitive. Those who have put Cullen in good (and elite) company as far as the Penguins are concerned. Gary Roberts, Mario Lemieux, Ken Schinkel, Tim Horton and Joey Mullen all played well into the years that most hockey players have long-since retired. Then you have the legend, Jaromir Jagr, who is still breaking records and defying the odds at 45. Age clearly means nothing if you are willing to put in the work and dedication to keep yourself in the game. Remaining active and staying in shape in the off season is crucial. This is how Cullen is able to keep playing as if he were half his age. "He's really a guy who commands a lot of respect with our coaching staff and his team mates because of how hard he works, the way he trains and takes care of himself. He's the consummate pro. I think that's what allows him to play into the years he's playing," said Head Coach Mike Sullivan when speaking to the media after Tuesday's practice. Though the team may love and respect him, that didn't stop prankster Marc Andre Fleury from giving Cullen a birthday shaving cream pie in the face Wednesday during morning skate. Forward Tom Kuhnhackl (who was a last-minute scratch against the Ducks) wanted nothing more than to give his mentor (who he respectfully nick named Team Dad) a win against his former club. The team would not disappoint. Not only did they win, they did so in convincing fashion posting a 5-1 victory. One of those goals being scored by the birthday boy off a beautiful cross ice pass from Tom Sesito. So what does Matt Cullen have to say for himself when asked how he has been able to play this long? The answer was simple: "I just love the game." (when speaking to the media after Wednesday Nov. 2nd's morning skate). Founded Cullen Children's Foundation, aka Cully's Kids, with his wife in 2003. The foundation provides financial resources to organizations that support children's healthcare needs with an emphasis on cancer.